Portugal is known for its hot and dry weather in the summer, especially in the month of August, with temperatures that can reach the 40ºC during the hottest days. afternoon and until the evening, creating difficulties in some of the lanes. A total of 30 categories, including 12 Olympic events will be raced at this World Championships. In Paracanoe a total of 12 events will take place, including 6 Paralympic events. We divide the sport facilities into limited and not limited zones, being the limited zones, the ones for exclusive use of the NF`s and all other accreditation persons at the event. The non-limited zones, will be access only using a bracelet, to be sold online and during competition days, at the venue. Check prices in the spectators tab. Inside limited zones, different access will be given to different collectives. There will be special parking areas, divided into Public, Teams, Staff, team Buses,VIP and Media. Access to each one of this parking will be controlled by access card in the car and plate number. This access will be given at the accreditation Centre. The parking area will be reduced comparing to last years, as the team quarters will be expanded outside the hangars. Naturally the public parking will be forced to start farthest from the venue main entrance. This area will be expanded from the hangars to the parking, creating a new global area for teams of around 20.000m2, including the new exterior area, with 7.500m2, plus 15 hangars area(interior zone) with 3.500m2 and boat storage and water access with 9.000m2. This will be one of the biggest teams quarters ever in an event like this. We will also change the access to the teams quarters. In 2018 all NF personnel will be accessing this zone directly from the parking lot, with an exclusive athletes red carpet entrance. The High performance centre main entrance will be used for public entrance, that can also be used by Teams. Also new boat racks will be created and with shadow capabilities in front of the hangars. The Goal is to reach a total capacity of 900 boats and better fixing/safety conditions. 1st boat control and the free weight zones will also be created in this area. There will be also a new paracanoe zone, in the old restaurant area, where all evaluations of this athletes will happen and also we will setup the paracanoe offices. The restaurant, with a capacity for 550 persons will be set outside the hangars, in front of the channel, with privilege views all the action. In 2018 we will also create the transport desk and control outside, next to the teams quarters entrance. All NF`s arriving to the Venue for the first time will be requested to stop at this point. At the main entrance of the Venue, you will find the staff offices and accreditation centre as well as new services to all participants and public, like lost and found, wardrobe service and ticket kioske. In the main square at the venue entrance we will setup different activities to all, including sport and non-sport experiences. In the non-limited zones we will have around 3700 seats available for public, a food square, social and sport activities free of charge, among other commercial services. In this zone, we will also include a info desk for public and at least 4 big screens for race broadcasting and live results system. All team entries ( numerical and nominal l must be made on line through SDP system from ICF. Entries can only be submitted by the National Federation through the on line entries system SDP by the specified closing date (midnight European time/ European summer time GMT+ 1 or GMT +2]. Anyone having issues accessing the system or with the entries should contact Narelle Henderson at ICF HQ at sdp@canoeicf.com. Please ensure the personnel responsible for submitting athlete profiles and entries on SDP first check whether an athlete is already in the database for another discipline before adding the athlete. Any athlete can have additional disciplines added to their record as required by checking the box for their new discipline in the profile. This will ensure all competition entries and results will be attributed to the one profile. The preliminary entries, travel and accommodation requests must be done at www.canoesprintportugal.com using your NF' s Login and password, used back in 2013 to 2017 events done in Portugal. We will need to be provided with a proof of being someone from the NF's to contact us. After the approval from the organization you will receive a new email with your login details and you are ready to proceed. 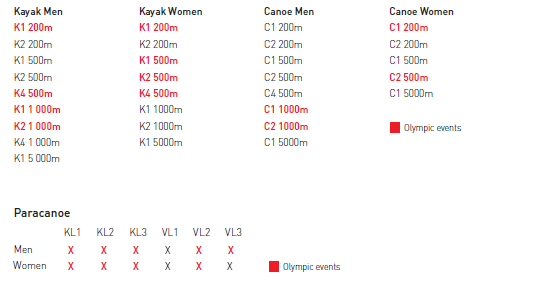 If you have any question concerning this entry system please contact registration@canoesprintportugal.comm. Travel info: Opens in February 2018 and must be sent at least until 3rd of August. The Organizing Committee will use the International Canoe Federation protocol guidelines for the participation system. The Participating fee is already included in the given prices for our accommodation packages. The fee must only be paid for those who decided not to book accommodation through our organizing committee. Teams not Booking accommodation through the organizing committee may reserve lunch at the venue. The Organizing Committee has established protocols with almost all hotels in the region to provide several options for accommodation and assure reasonable rates. The main focus for accommodation will be in the cities of Coimbra and Figueira da Foz. Other Accommodation is also available in smaller places near the course. Due to the very high season that the month of August is in Portugal, especially near the ocean and the beach, where Figueira da foz is, we had to concentrate more than 50% of the logdging option not in Figueira da Foz. We have pre-booked a total amount of more than 1700 beds in a total of 17 hotels. We were still able to keep a certain amount of beds in different category hotels in Figueira as we know most of the countries would like to keep their teams near the ocean and closer to Montemor-o- Velho. Besides the Airport shuttle, described already in this document we will supply daily shuttle service from choosen hotel to the venue and return. Timetable will be provided at least 15 days before the event week. Only accredited persons from teams may use this transportation system. The event will be covered by a civil responsibility insurance in case of damage of 3rd party elements at the venue. All hospital services provided in our public health care service must be paid directly by the athlete or by the National Federation he/she represents. Medical assistance at the venue will be provided for first aid and it is included in the daily fee. Urgent or more complicated cases will be taken into hospital. Transport service will be under the organizing committee responsability. All countries identified in the official bulletin are not required to request a visa to enter in Portugal. The Organizing Committee through the Portuguese Canoe Federation will write an invitation letter on request. Only persons inside the SDP ICF system and accredited for the event will be able to apply for this invitation letter. provided by our partner NELO.